United Regional is proud to be able to provide the women in our community the latest technology available today, which improves breast cancer screening and detection. This technology helps to identify cancers at the earliest stage when they are the most treatable. Digital mammography is still one of the best technologies available today – but it is only two-dimensional (2D). With 3D Mammography, often referred to as breast tomosynthesis, radiologists are able to see breast tissue in one millimeter slices. Fine details are more clearly visible, no more hidden by the tissue above and below. Read more. Biopsies are the only definitive way to confirm that a breast abnormality is benign (non-cancerous) or not. Stereotactic breast biopsy is an alternative to open or surgical biopsy and is a safe and minimally invasive form of breast biopsy, which can more accurately pinpoint the mass. 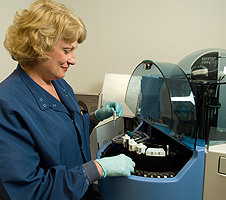 It is used to obtain tiny samples from an abnormal breast mass for examination by a pathologist. Read more. Sepsis is a serious and sometimes life-threatening condition, in which the body is fighting a severe infection that has spread throughout the bloodstream. Every year, severe sepsis strikes an estimated 750,000 people in the United States. Mortality can be as high as 50 percent in the case of septic shock, the most severe form of sepsis. Early recognition of sepsis and timely initiation of appropriate therapy is key for survival from this potentially devastating condition. Read more.